Congratulate your friend on a job well done! 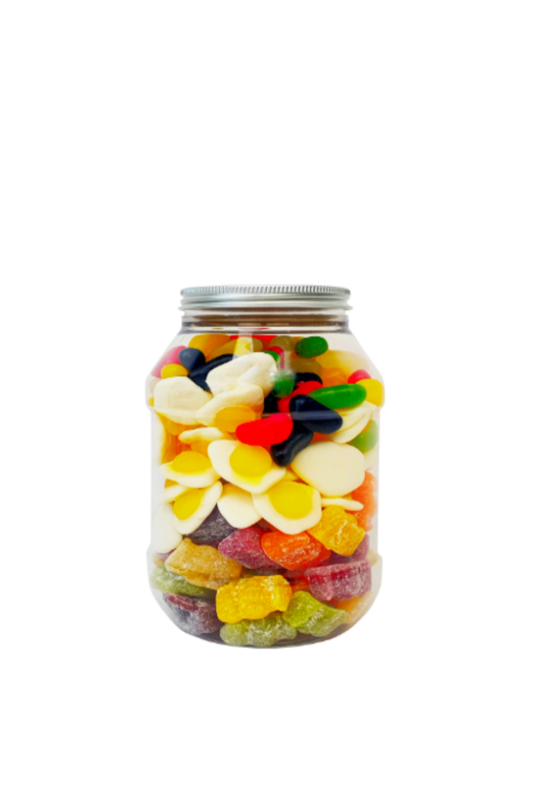 Perfect for the person who has just passed their driving test, bagged a new job, or made it through exam season with their sanity intact, this smashing jar of Congratulations Candy is sure to put a smile on the recipient's face! 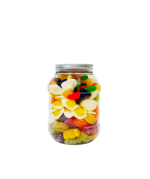 Hard work should always be rewarded, so why not reward it with this irresistible jar of candy? It is an unquestionable fact that Congratulations Candy is a guaranteed way to make your 'congratulations' message a whole lot sweeter! Product 1: Glucose syrup (contains SULPHITES), sugar, maize starch, pork gelatine, water, acids (E270, E330), vegetable oils (coconut, palm kernel), flavourings, colours (E100, E120, E132, E153), glazing agent (E903). Product 2: Glucose syrup, sugar, water, gelatine, acidity regulator (citric acid), humectant (sorbitol), grape juice concentrate 1.25%*, flavourings, glazing mix (coconut oil, glazing agent (carnauba wax), colours: E102, E129, E133, E171. (*1.25% fruit concentrate = 5% fruit juice). Product 3: Glucose syrup, sugar, beef and pork gelatine, corn starch, humectant: sorbitols; acids: lactic acid, citric acid; modified potato starch, gelling agent: pectins; flavourings, fruit and veg concentrates: radish, pumpkin, apple, tomato, blackcurrant, carrot; coconut and palm kernel oil, glazing agent: carnauba wax, beeswax; colours: E120, E171. Product 4: Sugar, maize starch, dextrose, acid: tartaric acid; acidity regulator: sodium hydrogen carbonate; flavourings, colours: E100, E132, E162. Product 5: Sugar, glucose syrup (SULPHITES), whey powder (MILK), vegetable oil (palm kernel oil, palm stearin oil), sweetened condensed MILK, salt, emulsifier: SOYA lecithin E322, invert sugar syrup (treacle), butter (MILK), colour: carbon black E153 & flavourings. Also may contain PEANUTS & EGG. Product 6: Dextrose, sugar, acidity regulator: citric acid, artificial flavourings. Product 7: Sugar, glucose syrup, acid: citric acid; flavouring, colours: E102, E104, E110, E122, E129, E133, E142. May also contain SOYA and MILK. Product 8: Sugar, glucose syrup, acidity regulators: citric acid, malic acid; Raising Agent: sodium bicarbonate; flavouring, colours: E120, E133. May also contains MILK, NUTS, SOYA and GLUTEN. Product 9: Glucose syrup, sugar, starch, acid, citric acid, flavourings, fruit and plant concenrates: orange, elderberry, lemon, mango, passion fruit, blackcurrant, aronia, grape), elderberry extract, glazing agents beeswax, carnauba wax, colour: copper complexes of chlorophyllins), carob extract, invert sugar syrup. Ingredients on Wrapper (Sherbet Fountain). For allergy advice, including cereals containing GLUTEN, see ingredients in bold and capital letters. Warning: E110, E104, E122, E129, E102 and E124 may have an adverse effect on activity and attention in children.